Hi Kids, all of you, young and old. You know, today’s not just another normal Sunday. Today is a special Sunday and we call it “Christ the King.” On this day, we remember that, even though Jesus came to us as a poor baby, and lived among us as a poor man, and died the death of a criminal on the cross, on this day we celebrate Jesus who is still the King of our hearts. And we celebrate Jesus especially today because today is the LAST day of the Church’s year. Next Sunday we will begin a whole new Church year and we’ll call that day the First Sunday of Advent. The readings we heard today are also about Last Days. A Last Day can be both a happy and a sad time. We can be happy if we know that what’s going to come is going to be even better than what was before. For example, we can be happy on the Last Day, just before a vacation. And yet, we can be sad too. If we miss the old times too much, we’ll be sad. If we didn’t do something we should have done before that Last Day, that could make us pretty sad too. Jesus is reminding us today that He is watching everything we do. And that shouldn’t scare us. It should actually comfort us, knowing that Jesus is looking after us. Father gave me a great example of how to show you this. How Jesus is always watching and caring for us. The way a “carbon copy” worked, was that a black sheet of “carbon paper” was placed between two clean sheets of paper and what was typed or written on the top sheet would be copied on the one beneath it. Show LOVE on both sheets. So now, let’s all play a little game. We know that there are all different kinds of people out there. And they all have different effects on us. We either LOVE them, we HATE them, or we do our best to IGNORE them. Now, here we have a sheet of paper with pictures of some of these different kinds of people. And I’d like you all to decide how they affect you. LOVE (thumbs up), HATE (thumbs down), or IGNORE (flat hand). Write (their choice) over each small picture on top page. Now Jesus said, what you did for the least of my brothers and sisters you did for me. You see, even though we don’t see God directly in the faces of other people, what we Do or what we Think about other people is written on the Face of Jesus too. Now that doesn’t mean that we have to love the nasty things some people do. But they are all children of God and hating them sometimes hurts us more than it will ever hurt them. So with people who act badly, what we can do is pray for them and for their souls, that the power of God can change their ways and help them to act more fairly to others. 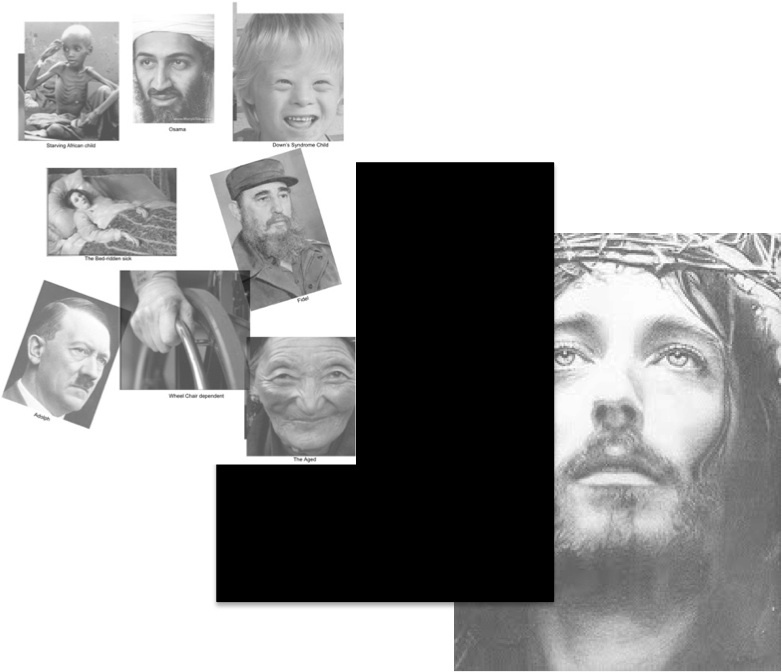 Now show Jesus’ face picture with “Love” and “Hate” carbon copied in different places. And yet, Jesus will always love us. We just don’t need to hurt him any more. In just a few moments we will be bringing a brand new child into our Church through the Sacrament of Baptism. In that ceremony, Grady will be anointed with a special oil called Chrism. That Chrism will mark Grady as a Child of God. And just like the carbon copy, the oil will mark Grady’s forehead and be copied into his entire being making him a part of this Body of Christ, the same Body of Christ we are ALL a part of, including Jesus in the Holy Eucharist. Now as little kids, we might be wondering just what we can do to make any kind of difference in the world? Well, God gave us all (even us adults) a very special gift that we can use to build His Kingdom among us. And it doesn’t take words, and it doesn’t take lifting weights or building Churches. All we need to do to change the world around us is SMILE, and know always that Jesus loves us (all of us) – no matter what! Thus says the Lord GOD: I myself will look after and tend my sheep. As a shepherd tends his flock when he finds himself among his scattered sheep, so will I tend my sheep. I will rescue them from every place where they were scattered when it was cloudy and dark. I myself will pasture my sheep; I myself will give them rest, says the Lord GOD. The lost I will seek out, the strayed I will bring back, the injured I will bind up, the sick I will heal, but the sleek and the strong I will destroy, shepherding them rightly. As for you, my sheep, says the Lord GOD, I will judge between one sheep and another, between rams and goats. The LORD is my shepherd; I shall not want. In verdant pastures he gives me repose. Beside restful waters he leads me; he refreshes my soul. He guides me in right paths for his name’s sake. and I shall dwell in the house of the LORD for years to come. to the one who subjected everything to him, so that God may be all in all. Jesus said to his disciples: “When the Son of Man comes in his glory, and all the angels with him, he will sit upon his glorious throne, and all the nations will be assembled before him. And he will separate them one from another, as a shepherd separates the sheep from the goats. He will place the sheep on his right and the goats on his left.